The thing I dread most is my daughter picking up headlice, I know it's all part and parcel of school life but they are so hard to get rid of. I'm trying my best to prevent it as much as I can. It can be frustrating, as sometimes it takes a while to discover the little critters. Normally buy the time there are signs ( itching and scratching) the infestation has already taken place. I use a few drops of tea tree oil in shampoo and it's used regularly at family bath time im hoping it stamps out infestation before it takes hold, killing the lice that have unknowingly been contracted. This is only a prevention and doesn't always detour the lice. When looking for lice they normally like places behind the ears and the nape of the neck and generally near the scalp.A head louse is a small insect, visible to the naked eye, about the size of a sesame seed (2 to 3 mm), which lives on the scalp and feeds on human blood. It has six legs armed with pincers used to cling to the hair, they move very quickly, which explains why it is so hard to catch them. They are normally a clear/white colour. The lice multiply rapidly and after only a week the female lice can lay 5-10 eggs per day. Then only after a week they will hatch and reach adulthood in two weeks. The life cycle of a louse is only 50 days, but the infestation if not treated can go from one to hundreds really fast. There are two types of solutions against lice, treatments with the use of repellents and products which act mechanically. Lice have developed resistance to some repellents which can irritate young children's scalps. Those formulated with dimethicone and silicone derivative, of synthetic origin and harmful to the environment. Those formulated with vegetable oils, which are natural. 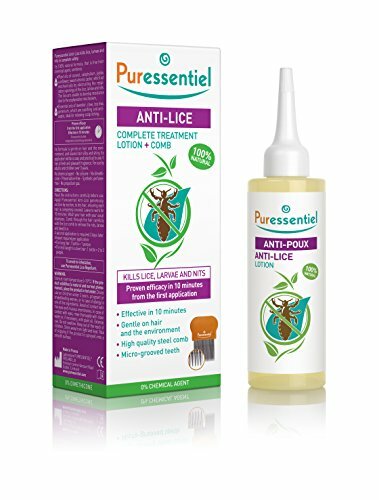 Puressentiel Anti-Lice range is guaranteed to be from 100% natural origin and gentle for young people's scalps. Puressentiel product is effective, practical, natural, harmless and acts quickly. The formula is be gentle to the hair and scalp (no neurotoxic repellents), from 100% natural origin and harmless to the environment.
" In collaboration with Puressentiel "